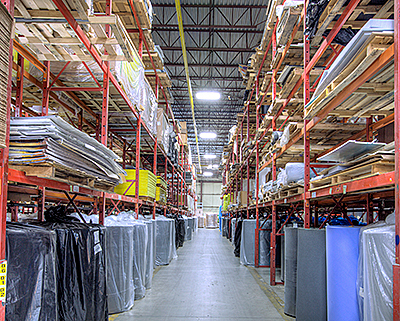 American Acoustical Products facility contains almost every process available to create any acoustical product or component. Flexibility and creativity are our key advantages and with our loyal skilled workforce we can deliver to virtually any specification required. Please view some of the equipment and processes we have in house to be able to manufacture our wide range of materials and products. 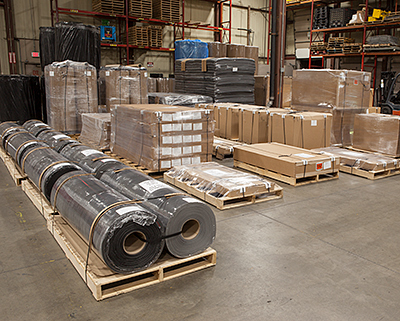 Click here to learn about American Acoustical Products' technical support capabilities. American Acoustical Products is registered to ISO 9001:2008. 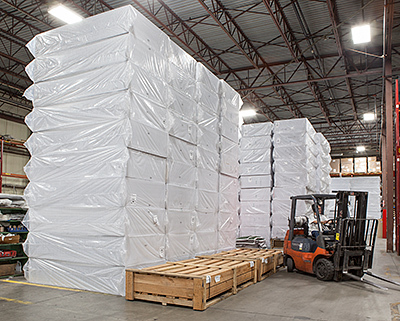 American Acoustical Products’ extruding line makes vibration damping sheet material using our own damping compounds which can be formulated to meet various fire requirements. Our casting barrier process produces a superior bond between fabric or foam. Films, special barriers and surface effects can be laminated either by sprayed structural adhesives or by thermal web adhesives with pressing or by hot rolling. High speed waterjet machine includes servo controlled roll feeding capability integrated with an automated feed across a large 8’ by 12’ cutting bed. American Acoustical Products has a department dedicated solely to fabricating custom parts for our customers. Industrial sewing machines, Velcro, grommets and hooks can be added to components.